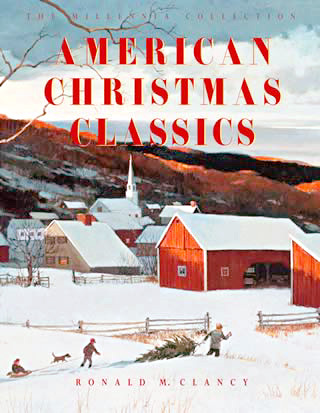 Read the richly illustrated history about American Christmas music and hear how carols and seasonal favorites sounded from the Revolutionary War era to the 20th century. Relive America's "Golden Age of Christmas Music" from 1934-1958 when the finest holiday songs, still popular today, were first released, and enjoy the wonderful images of America's Christmas past, including Christmas cards from the Victorian Age, illustrated covers from The Saturday Evening Post, Collier's, Scribner's, McCall's, and LIFE magazine, as well as one of the finest collections of American Christmas art from American favorites as Norman Rockwell, N.C. Wyeth, Grandma Moses, Henry Ossawa Tanner, and other great artists. Collect this second in the planned ground-breaking series of Christmas music products titled THE MILLENNIA COLLECTION: Glorious Christmas Music, Songs and Carols that describes the development of Christmas music since the early centuries of Christianity. Reflect upon the spiritual heritage of the American Christmas with world renowned carols, including O Little Town of Bethlehem, Away In a Manger, We Three Kings of Orient Are, and It Came Upon the Midnight Clear. 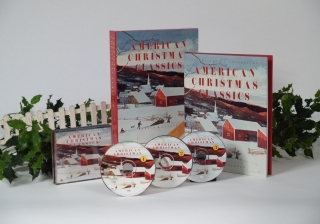 Enjoy classic recordings with original recording artists, such as White Christmas (Bing Crosby), The Christmas Song (Nat "King" Cole), Rudolph the Red-Nosed Reindeer (Gene Autry), and The Little Drummer Boy (The Harry Simeone Chorale), as well as popular carols and songs by traditional American icons like Kate Smith, Mahalia Jackson, Johnny Mathis, Tammy Wynette, and Perry Como. Delight in the discovery of America's little known jewels, including The Cowboy Carol from the Southwest, Star in the East from the early frontiers of the South, and The Star Carol and Caroling, Caroling from the nation's heartland. Sing along with the kids at home to the jaunty lyrics of Jingle Bells, Here Comes Santa Claus, Frosty the Snow Man, Santa Claus Is Comin' to Town, and Winter Wonderland. Learn how St. Nicholas evolved into Santa Claus while thumbing through 'Twas The Night Before Christmas and listening to Clement Clarke Moore's famous poem put to song, or about the origin of "Kris Kringle," or the story behind Rudolph the Red-Nosed Reindeer. Experience the wonders of The Carol of the Bells, its tune of Ukrainian origin, and the soulful Mary Had A Baby or its spiritual cousin Go Tell It On the Mountain, both of African-American roots, and the folk classics, Jesus, Jesus, Rest Your Head and I Wonder As I Wander, from the hills of Appalachia. - Do You Hear What I Hear? - What Are You Doing New Year's Eve? Colorful collection of 91 images, including Fine Art and Illustrations from America's great artists, such as Norman Rockwell, Henry Ossawa Tanner, Grandma Moses, N.C. Wyeth, Eastman Johnson, Sarah Stilwell Weber, as well as images from the Smithsonian museums, Victorian Christmas cards, and popular periodicals such as The Saturday Evening Post and LIFE magazine. Lyrics of all 47 carols and holiday songs. 3 sensational CDs of uniquely American Christmas music. One of the most sumptuous Christmas music gifts, and enjoy this second volume from THE MILLENNIA COLLECTION, a groundbreaking series of special Christmas music products planned for future release, and increase your knowledge about Christmas music.